They sign ballot argument and plan $4 million campaign to kill it in June. 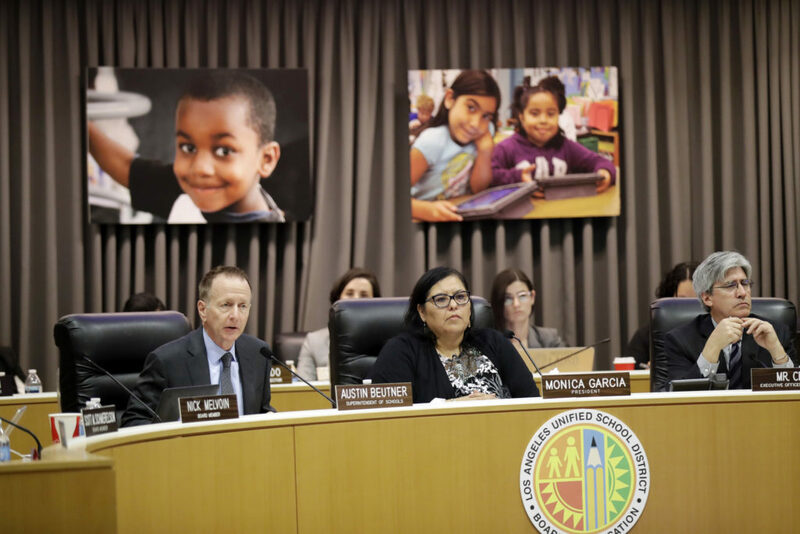 Los Angeles Unified School District Superintendent Austin Beutner, left, president Monica Garcia, center, and executive officer Jefferson Crain at a recent school board meeting. With Beutner's recommendation, the board unanimously voted on Feb. 28 to place a parcel tax on the June 4 ballot. Three Los Angeles area business associations have signed the official ballot argument opposing L.A. Unified’s sizable 12-year parcel tax on the June 4 ballot — compounding the district’s challenge of getting a two-thirds majority required to pass it. The opponents include the influential Los Angeles Area Chamber of Commerce. Parcel tax backers had hoped that business community leaders would take no position, if they couldn’t support a parcel tax. 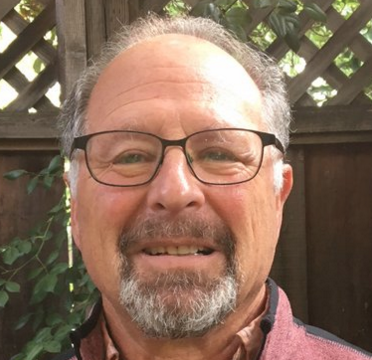 Instead, opponents are promising a vigorous $4 million campaign to defeat Measure EE, said Stuart Waldman, president of the Valley Industry and Commerce Association, based in the San Fernando Valley. Waldman, L.A. chamber President and CEO Maria Salinas and Tracy Hernandez, founding CEO of the Los Angeles County Business Federation, also signed the ballot statement, along with Jon Coupal, president of the anti-tax Howard Jarvis Taxpayers Association, and former South Gate Mayor Bill DeWitt. The chamber initially said it would support a standard parcel tax, charging every property owner in the district the same dollar amount. But the organization has followed through with its threat to oppose what the school board adopted: a parcel tax based on the square footage of buildings on a property – an approach that would substantially shift the tax burden from homeowners to commercial properties, large apartment buildings and industrial sites with large buildings. But the ballot statement that she signed, which will be mailed to all voters in the district in late April, is harshly critical of the district. Waldman said he wrote the initial draft of what was a document by consensus. Measure EE is projected to raise $400 million to $500 million annually, with charter schools receiving about 20 percent, based on their share of student enrollment. The school board, which unanimously voted for the parcel tax, says it will need the money to hire teachers in order to lower class sizes, add counselors and school nurses and pay for raises the board agreed to in the contract signed with teachers in January following a six-day strike. Without the additional revenue, the measure says, there will be “harmful cuts” to programs, probable layoffs and larger class sizes in 2021-22. The school board quickly moved forward with a proposed parcel tax both to ensure that revenue will start flowing in 2019-20 and to capitalize on strong public support in polling for striking teachers’ demands. In her statement, Salinas cited the board’s choice of an off-year election, which usually draws a small turnout — “We believe more voters is better for democracy” — as well as haste in making its decision as reasons for the chamber’s opposition. “The school board approved the 16 cents per square foot parcel tax without giving consideration to our suggestions or getting community input,” Salinas wrote. According to an analysis by Los Angeles Mayor Eric Garcetti’s office, most homeowners in Los Angeles and the two-dozen communities in the district will pay between $100 and $450 per year. The median tax would be $235 for an owner of a 1,450-square-foot home. The Yes on Measure EE campaign also is promising a vigorous campaign, with United Teachers Los Angeles and other unions behind it, as well as Garcetti, who stepped in to help negotiate the teachers’ contract and whose signature is first on the official ballot statement favoring the tax. It’s too much. I already pay $9k in property tax per year to live in an unremarkable middle class neighborhood. Now you want to tack on a few hundred more? There is a limit to what people can afford. The educators work just half a year, and the students only get 180 days of instruction each year. For more taxes, do they get more? This statement is so false. We don’t work half the year. People have no idea how much work we do at home, on weekends, and even during winter, spring, and summer breaks. Also we are required to stay 7+ hours on our campuses, yet we are paid for 6. We are mandated to attend trainings and professional developments, often for nearly a third of our hourly pay. Many of us attend conferences on our breaks for no pay, and we pay for the conference fees out of our own pockets. Also, during the year we use our own money for resources, supplies, and incentives for our students. So please, think about this before saying that educators work half the year. LAUSD is totally bankrupt and of course business people see it! LAUSD should be closed! Just look at 4 years of data! (http://sipbigpicture.com) They subscribe to Einstein’s definition of insanity: Continue to do the same things over and over expecting different results. 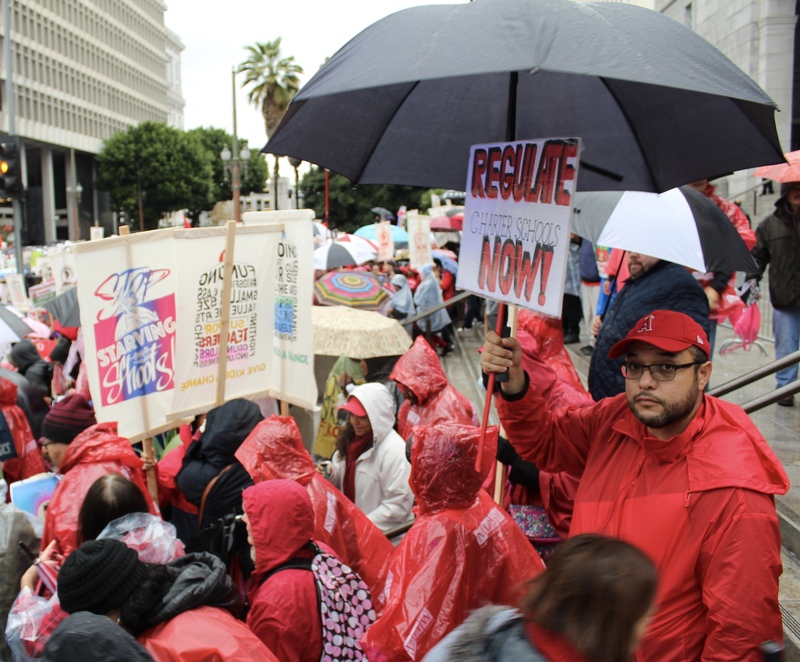 Business people know it’s time to totally reorganize the LAUSD before they commit to Mo Money!